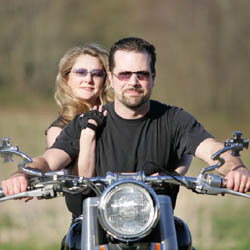 There are all types of motorcycles and all types of motorcycle riders, and along with that diversity comes a large number of ‘Biker’ specific websites. Whether these sites are focused on a specific brand of motorcycle, or on motorcycle products/accessories, or they are biker forums, they all have one thing in common, they draw the attention of motorcyclists. And motorcycle riders love their bikes. They love riding them, talking about them and interacting with others who share their interest in biking. With bikers, either you ‘get it’ or you don’t. While Advertisers use a number of approaches to reach bikers, it’s hard to find a better place for Advertisers interested in reaching the ‘Biker Community’ than on biker related websites? The key to effective niche advertising is to know your target market, and to be able to reach that market effectively, and to do so in enough places that your message begins to take hold. Whether Advertisers are ‘selling’ a biker related website, product or service, the focus is on making sure that bikers see their ads repeatedly. One of the benefits of working with Niche Ad Network is that Publishers of Biker related websites need only add the Biker Niche Channel Ad Zone code into their sites, and Advertisers can reach bikers on a number of sites with the same ads. As the Niche Ad Network list of Publishers with Biker related sites grows, the effectiveness of repeated exposure across numerous biker related sites grows. While it’s clearly important to Advertisers to reach their target demographic, it’s equally important to website Publishers that advertising within their sites is effective, which means lucrative. Common sense dictates that relevant ads related to the interests of the visitors of a website are much more likely to be clicked. Placing biker related ads on biker related websites just makes sense. The question is how to do it. Publishers either have to create their own internal advertising system, which is costly and difficult to manage, or they have to work with outside advertising systems. That is where Niche Ad Network comes in. Publishers need only register and grab the Biker Niche Channel Ad Zone code to immediately open up the ad space for Advertisers looking to reach the ‘Biker Market’. By focusing ads for bikers on biker related websites, everyone in the advertising ‘chain’ wins.